The River Goyt is one of the most beautiful features of the district, a walk along its upstream banks as it runs through the Marple area takes one through woodlands, past weirs and waterfalls and on towards a single span of great age, although not as old as its local name Roman Bridge implies. At this point in the Goyt Valley one can plainly see the largely rural character of the district, the land rising sharply to the moorland of Mellor. The Goyt is also home to the Manchester Canoe Club, who regularly hold slalom competitions and river races there. 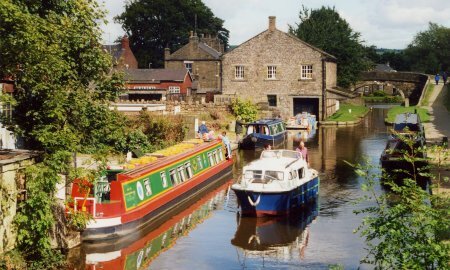 The Peak Forest Canal runs from Whaley Bridge in Derbyshire, where an arm also services nearby Buxworth, through Furness Vale, New Mills and Disley to Marple, where it is joined by the Macclesfield Canal. At Marple the canal descends a flight of sixteen locks, lowering the level by 210 feet before crossing 100 feet above the River Goyt on a magnificent three arched stone aqueduct. The canal continues through Rose Hill cutting, originally a tunnel but opened out many years ago, on to Romiley, Woodley, Hyde, and Dukinfield before its junction with the Ashton Canal. The total length of the canal is a little over fourteen miles. In the year 1999, we celebrated two anniversaries on the Peak Forest Canal. 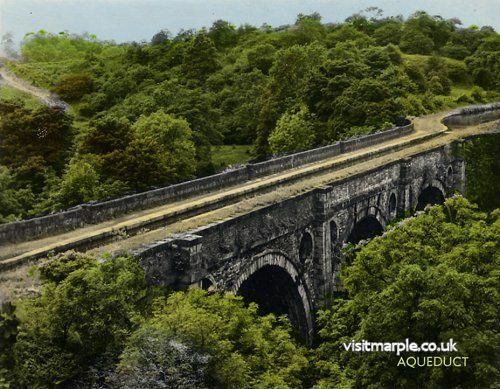 One was the bi-centenary of keying in the arches on Marple Aqueduct, the other was a silver celebration. 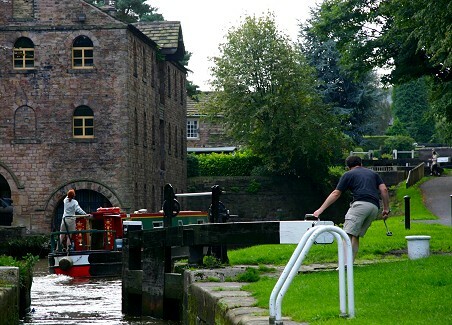 It was twenty-five years ago in May 1999 since the Marple flight of locks reopened. Surprisingly it was an event on the aqueduct that led to the canal's restoration. The Peak Forest Canal was sanctioned by Act of Parliament. Act 34, George III described an Act for making and maintaining a Navigable Canal from and out of the Canal Navigation from Manchester to or near Ashton-under-Lyne and Oldham, in the County Palatine of Lancashire. At the intended aqueduct bridge in Dukinfield, in the County of Chester. To or near Chapel Milton in the County of Derby. And a communication by railway or stone road from thence to Loads Knowle in the said County of Derby, and a branch from out of the intended canal to Whaley Bridge in the said County of Chester. Without fanfare or celebration a major anniversary has quietly been reached in Marple this Millennium year. A milestone that would have most towns hanging out the flags and bunting has barely been acknowledged in the local community. The achievement is all the more significant because it would not have happened without strong public support many years ago, so it is ironic that it appears to be passing almost unnoticed now. "Few things so beautiful in their origins as this Canal, which it be known, with its locks and its aqueducts, the grandest of which last is the stupendous erection near Stockport which by the bye filled my mind when a boy with wonder, constitutes the grand work of England, and yields to nothing in the world of the kind, with the exception of the Great Canal of China". From "Wild Wales" by George Borrow.